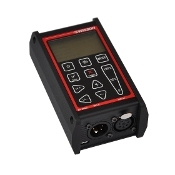 The XMT-350 is a compact and modern RDM Controller and DMX tester. RDM-enabled devices can be monitored and controlled with the XMT-350. The XMT-350 can also monitor DMX signals and display them graphically.